There’s no easier way to make a living than as a non-white activist in the American conservative movement. Simply offer well-meaning whites the nectar of racial absolution and say you care about their country, and they will throw money at you no matter what else you tell them. The recognized master of this unique form of hucksterism is Dinesh D’Souza, who specializes in capitalizing on implicit white identity while making sure it is funneled into ideological dead ends. D’Souza is worthy of special opprobrium because of his actions against Sam Francis and Jared Taylor. D’Souza’s hostile, sensationalistic, and dishonest coverage of the 1994 American Renaissance conference was one of the main factors in the dismissal of Sam Francis from the Washington Times. Of course, D’Souza also stole the writings of Jared Taylor without attribution — as Slavoj Žižek can testify, something that seems to be going around these days. His effort at positioning himself between multiculturalists and evil white racists, The End of Racism, was so filled with distortions and smears that the entire first run had to be pulped by the publisher. Needless to say, his deeply dishonest game of “I’m not a racist, those guys over there are the racists!” has not protected him from Eric Holder’s Department of Justice, something impossible to view without at least some schadenfreude. D’Souza’s shamelessness continues to the present day. After his last documentary, he was caught in a scandal over alleged adultery and had an ignominious exit from the presidency of a Christian college. But after only the briefest respite, he has resurfaced with his latest documentary America, and continues trolling both Left and Right with flimsy narratives of persecution and liberal bias against virtuous, colorblind conservatives. America is subtitled Imagine a World Without Her. It begins with an alternate history where George Washington is killed in battle. Several supposedly negative scenarios are outlined, from a Southern victory in the War of Northern Aggression to Germany winning World War II. But instead of exploring these, D’Souza spends the bulk of the movie defending America against the charges that it is racist and exploitative. He concocts a theory that America has transcended a “conquest ethic” in favor of a production ethic of wealth creation. D’Souza thus smoothly transforms the race-driven hatred of anti-American Leftists into an economic dispute over resources. Wave the flag, roll credits, vote Republican. From the perspective of interest and entertainment, D’Souza squanders the promising premise of the film. A history of the world without America could have been genuinely provocative. However, he can’t do that because what his Left-wing critics hate is not “America” but the white people who created her. He has to transform the visceral racial politics of American history into a policy dispute over Obamacare. That’s how the scam known as Conservatism Inc. operates. But there’s a deeper question here for Traditionalists. All of D’Souza’s “charges” against America come from the Left. Perhaps the film that needs to be made is a critique of America from the Right. America, Imagine a World Without Her: From Our Eyes. As our leaders are never tired of telling us, America is an idea, not a nation, and the idea is that human beings are born with certain unalienable rights. Government exists only protect the rights of individuals, leaving them free to pursue the American Dream – which usually consists of working pointless jobs in order to buy more disposable goods in the Lockean shopping mall we call a country. 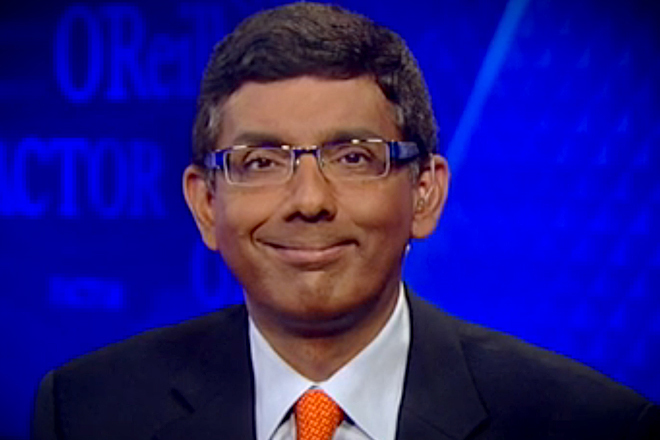 D’Souza is fond of quoting Alexis de Toqueville in his film but leaves out his observation that “Americans are so enamored of equality that they would rather be equal in slavery than unequal in freedom.” Joseph Sobran once said that conservatives should ask liberals if there was any society in which they would be conservative. He missed the point. The endless march towards the impossible ideal is the American story, an absurd quest doomed to failure and destined only to lead to a continual destruction of everything worthwhile. The only escape is to say from the beginning that the ideal itself is absurd. Had the forces of King George III succeeded, perhaps this sinister spectre of “rights” would not have been unleashed into the world. We can imagine a world where the “age of sophists, economists, and calculators” that heralded the end of the “glory of Europe” was postponed, if not prevented. And while a monarch still reigns in the Court of St. James, it is but hollow symbolism. The annihilation of the aristocratic principle heralded by Yorktown has transformed the royal houses of Europe into a tourist attractions for decadent democracies rather than bulwarks of Tradition. Unfortunately, the colonials were saved by Louis XVI of France, who – in foreshadowing of the West’s entire history over the next few centuries – would be slain by the very egalitarian forces he unleashed in the interest of petty power politics. America defined itself as a rejection of the Old World with its kings, traditions, and nations. During the 19th century, the rising commercial and business classes, communicating vessels of the liberal ethos, allied with the cosmopolitan capitalism of the British Empire and the ascending economic might of America’s new low-church empire — an alliance ideologically arrayed under the banner of “Anglo-Saxonism” and implicitly opposed to continental Europeans attached to Listian economics, landed property, authority, and tradition . . . Though the “true America,” transplant of Europe, shared her destiny, Yockey believed modern liberal America had become an anti-Europe endeavoring not only to subjugate, occupy, and oppress her, but to destroy her unique heritage of blood and spirit. This eventually expressed itself in a remarkably consistent opposition to European attempts to re-establish a link with Tradition. In what Revilo Oliver termed the “Crusade to Save the Soviets” of World War II, America ensured that Eastern Europe would be handed over to the Soviet Union – and then turned its attention to dismantling what Western European empires and white settler states remained. The anti-Communist Cold War that followed, rather than a jihad against the global Left, made racial egalitarianism a strategic necessity and established it as an American moral principle as the United States battled the Soviet Union around the world. Ironically, it is the United States that has emerged as the great champion of cultural Marxism even as post-Cold War Russia moves in a more conservative direction, raising the question for the American Right whether they actually lost the Cold War. It’s the American idea of a deracinated state founded upon human rights that triumphed in postwar Europe. It’s that idea that needs to be destroyed if Europe is to be liberated. And the only thing those Americans who are truly loyal to the Western Culture may be able to do today is prevent America from attacking, bombing, and occupying Europe if it rediscovers herself. In the world without America, Europe would have remained true to herself. The mother continent of the West would not be faced with the choice of being either a soulless museum or a conquered province of the Dar al-Islam. And the identity of Western Man would not have been deconstructed in order to make the world safe for McDonalds. Which brings us to . . .
One of D’Souza’s main points is that capitalism has created more wealth and has lifted more people out of poverty than any other economic system. He points to nations like India and China as examples of the power of the free market. It’s easy to say that vulgar American materialism is jeopardizing spiritual values, even though it’s true. Most people have little time for spiritual values if they can’t provide for their families. The problem is that D’Souza’s thesis fails on its own merits. The rising Asian Tigers that will dominate the economy of the near future follow a nationalist form of state capitalism. It’s easy enough to say centrally planned Soviet Communism is a proven failure. It’s far harder to say that American-style free trade, and debt driven, financial capitalism is somehow superior to that practiced by the other economic powers, especially considering how different our current system is from the original “American System” of tariffs, internal improvements, manufacturing, and high wages. The modern American outlook on economics holds that the nation exists to serve the economy, rather than the economy serving the nation. For example, ALL employment growth since 2000 in the United States has gone to benefit immigrants. From a nationalist perspective, this means that Americans have essentially been treading water for fifteen years. However, from an American financier’s perspective, an abstraction called the “economy” is growing, and therefore, the country is on the right track. Instead of examining issues like quality of life, the cost of raising a family, or whether employees enjoy job security, the American financial system focuses on the all-important issue of growing GDP, propping up the system through ever increasing debt and using the dollar’s status as the “reserve currency” to just keep printing more money to keep the charade going. The result is a something that cannot really be called a “culture” – just a market selling junk. The American economic system prioritizes spending over investment, consumption over creation, and cheap labor over efficiency and quality. While the “economy” is growing, the quality of life for most Americans is decreasing as living in a “nice” (white) neighborhood requires absurd amounts of resources. What a one income household could do on a union job not long ago now costs $130,000 a year. But that’s not the real crime. The real crime is not just that everything is a commodity, it’s that everything is a cheap throwaway commodity. Everything is disposable. Nothing is sacred, and everything is shoddy. What was the alternative? The organic society, the Volksgemeinschaft where the economy serves the nation and serves culture. Economic policy is formulated with the consideration of what will improve the quality of life for the community and the upward development of the race. Efficiency, quality, and beauty are priorities. Companies invest in workers and are tied to particular communities – a system which continues today in Germany, the powerhouse of the European Union. Instead of an economy that subsidizes the worst in people, we could have had something which promotes the best. But we didn’t. And when every community is destroyed, every worker ground into the dirt, and every neoliberal policy prized as holy writ, what is the result? A nation of unhappy consumers, addicted to prescription drugs, who build their lives around the accumulation of plastic junk. What’s more, even though materialism is all American culture has to offer, somehow, everyone is broke and in debt – as is the country itself. Having destroyed the European culture that created her, America is now fulfilling her destiny as an eternal revolutionary state by eating her own children. Even as this is written, the President of the United States is ignoring his responsibility to enforce the law to gleefully ship in immigrants from Central America. Some are gang members, some are carrying diseases, and none have anything to offer the United States except the open hand of a beggar or the clenched fist of an enemy. The effects of America’s own government are indistinguishable from that of military conquest by a foreign enemy. But millions of Americans support their own displacement because they see it as the fulfillment of their own national mission. And they are right. If America is an “idea,” and the pursuit of a “better life” is all that matters, why not let in the needy? After all, they would have a better life here. We won’t, of course, but it it’s not about us. White people have no particular claim to this land – which is, after all, simply an administrative unit for the management of the economy and the protection of “rights” – so why not let everyone in? However, the American ideology is not capable of making that argument. Self-conscious American patriots lack the vocabulary for a defense of their national existence, identified as it is with explicitly universal ideas. Thus America is the Spenglerian cycle of nations in accelerated form. The hardy pioneers, conquerors and settlers swiftly surrender their moral right to existence and collapse into decadence. And why shouldn’t they? After all, America isn’t a people and a history – it’s a flag and a piece of paper. These are the charges against America from the Traditionalist Right. And the truth of the indictment can be seen in the world around us – the world America built, the world that is killing us. D’Souza loves this country because it is the greatest defender of the classical liberalism that makes people like him possible. It is also the greatest enemy of white survival, and the greatest engine of white degradation. These two truths are complementary because when all is said and done, America, like D’Souza, is a scam. But every con has its end. The only way white Americans can survive is without America, and it begins by “imagining a world without her.” It’s easy if you try. Published: July 17, 2014 | This entry was posted in North American New Right and tagged America: Imagine a World Without Her, articles, conservatism, consumerism, Dinesh D'Souza, egalitarianism, globalization, Gregory Hood, non-white immigration, North American New Right, originals, race replacement, Republicans, Waking up from the American Dream. Both comments and trackbacks are currently closed. Okay … but how did whites live prior to the Enlightenment in a ‘Tradition’ dominated society? Poverty and social privilege denied the average white person a good living … ‘high culture’ existed, but would your average white want that at the cost of Walmart? Bottom line is that your average white has historically benefited from the French Revolution, consumerism, and neo-liberalism. (I’m well aware that the prosperity of America is more than just the result of ideology). America has been good … very good to white America for two centuries. D’Souza espouses what most white Americans not only have been conditioned to think, but intuitively feel as the result of the lifestyle they have grown up with. Dinesh isn’t a charlatan, he is partially correct in the vision he articulates about America’s economic greatness (which most whites would favor over a ‘cultured society’) being tied to its ‘openness’. I think this is where part of the WN audience gets confused and overly confident about the popularity of its own ideas; remember, the white bourgeoisie disdains ‘politics’, as Schmitt articulated, and will use any justification to avoid genuine politics. The bourgeois ideology isn’t really and ideology … it’s an escape mechanism (anti-political). I saw an interview where D’Souza claimed that black failure was not due to genetics or racism, but rather due to culture. Sure, he knows that’s a lie … but it’s an essential lie to the propaganda of bourgeois culture which denies the tragic, inequality, and violence so it can maintain the veneer of comfort and social ‘happiness’. Neoliberalism and Enlightenment presuppositions about the nature of man and race are just modes of avoidance that the bourgeoisie use to push away difficult questions, the potential for violence, and maintain their own immediate economic standing. There is a sizeable contingent, dear I say majority (? ), of whites, who have benefited from, fully support, and do more than pay-lip service to neo-liberalism, consumerism, and the logical consequences of Enlightenment ideology (more like theology). It just so happens that AT THE PRESENT MOMENT, whites are beginning to suffer from these long standing ideas due to the global shift in political and economic power. But these ideas have existed and been implemented for a long time, benefiting whites. Let’s be clear, the message of WN expressed on this site is anti-bourgeois … what that means is that D’Souza’s vision is really no different that what the average white in the street believes and has probably always intuitively felt for centuries. My point is that the Far Right has its own ‘enemies’ (not necessarily bad people, but nevertheless enablers), within, who favor the tyranny of the market and a culture-less world over that of Tradition, nationalism, or patriarch-tribalism. D’Souza IS articulating the interests of the white middle class. This issue is NOT as black and white as we, WNs, would like it to be. Excellent point that is as valuable as the article. Thank you. One of the best articles I’ve read. Everything is there. The universal libertarian-human rights empire, that is the US, has to go. And so also the EU, an exact replica of the american enligtenment-imperial nightmare. This essay is a classic: one that should be reposted every July 4th. It provides the strongest proof that ‘Liberalism is the death of Nations’, as Moeller van der Bruck put it. 1) The Age of Empires. Britain crushes the American revolt of 1776, and retains control of North America – in alliance with a number of indigenous tribes which are more than happy to see the colonists suppressed. Over time, these become proper states – some independent, but most as protectorates of the British crown. After initial clashes, a modus vivendi is achieved in the Western hemisphere between the British, Spanish and Portuguese empires. The French monarchy, weakened by its support for the unsuccessful American rising, is toppled within a decade, and Europe becomes the centre of revolution; the Americas the home of reaction. An ironic contrast. 2) The New Industrial Order. Stonewall Jackson narrowly avoids getting killed by his own men, and goes on to lead alongside Robert E. Lee at the battle of Gettysburg. That victory, is followed by two others that ultimately bring British and French recognition of the Confederate States of America (C.S.A.). A bitter USA increasingly finds itself attracted to the other rising industrial power – Imperial Germany. In 1914, Washington sides with Berlin whilst Richmond sides with London and Paris; the Only World War takes place on two continents, and ends with the industrial powers triumphant, with only the weakened British Empire remaining as an archaic holdout. Transatlantic relations become synonymous with Prussian-Midwestern relations, and a long period of peace, prosperity and protectionism follows, with each side acknowledging the other’s sphere of influence. As Berlin’s influence spreads into Russia, and the USA’s into Latin America’s, German becomes the language of the Eastern hemisphere, and English of the Western. 3) The Age of National Socialism. With the defeat of the Anglo-saxon plutocracies by the Eurasian alliance of Germany, Italy, Japan and the USSR, capitalism gives way to various forms of socialism/fascism. Of these, the most popular is that of National Socialism in the Third Reich, which is hailed as being responsible for the revival of Germany after the First World War and its victory in the Second. Newly independent former colonies in Africa and Asia, as well as the nations of Latin America witness the growth of fascist parties and the attempted implementation of national socialist policies – all with the aim of turning the state into the next Germany. Dictatorship becomes the norm, with each strongman seeking to emulate the Führer. Germany replaces Britain as the pre-eminent Western nation, in terms of prestige and power; Japan’s Co-Prosperity Sphere replaces the British Empire in the East, while the USSR dominates West Asia: at the Yalta summit, Stalin, Hitler and Tojo carve out their spheres of influence; Italy creates its own empire in Northern Africa, stretching from Morocco to Somalia..
4) The Age of International Socialism. With the defeat and disintegration of the United States, the Cold War ends with an emphatic victory for Soviet communism. The USSR emerges as the sole superpower, with the Warsaw Pact and Comecon expanding to incorporate Western Europe. Hereafter, Moscow becomes the centre of international diplomacy, though its efforts are diverted into managing relations with an increasingly powerful China, a dynamic Japan, and restive Muslim countries to its south – all of whom form an unwritten anti-Russian alliance, backed by Britain and other Anglo-saxon states. Central planning’s superiority to the anarchy of market forces is uncontested, and country after country nationalizes the banks, large corporations, retail trade etc.. and turns the economy into another branch of the government bureaucracy. Despite irritations over inefficiencies and incompetence, as well as concerns over surveillance and repression of political dissidents, an era of relative prosperity and security follows, as new technologies are harnessed for state security and public welfare. One thing that I don’t see in any of these four scenarios, is massive immigration. This essay offers a brilliant, rising, inspiring denunciation of the worst America has to offer. In so many ways, the daily American experience contains all the ingredients of a farce. In many respects, America is not a serious nation. This is true. Unfortunately, in other respects that matter a lot America is still a very serious and deadly nation run by ruthless people. For example, as I’m sure readers here are well aware, Jews, yet again, are engaged in the mass slaughter of Palestinian civilians, including children. Despite murdering children playing soccer on a beach, Jews have- -what else–full backing from America. What a fantastic article. I agree completely. What is written here might be the most important point White Nationalists can make. I underwrite all your toughts and observations 100%. Nothing to add. Which would still be false but maybe it would have wrought less havoc. Lucid, Limpid, Logical – prose more beautiful than poetry because true. But alas about a very ugly reality. Great picture of D’Souza. He looks like a dark skinned Alfred E. Neuman. You are quite right. The picture reminded me of an image, but I couldn’t name it. Yes, the same expression in toto as Alfred E.Neuman’s. People should be required to memorize and recite this article before being allowed to vote. In extreme cases, perhaps it could be tattooed on their forearms.